I hope you all had a great Easter weekend! 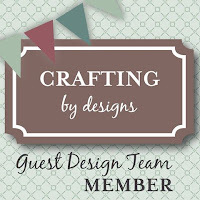 I'm sharing a card with you today that I made for my Guest Designer spot at the fabulous challenge blog Crafting By Designs. The current challenge is "ANYTHING GOES". This is an easy one ladies, so I do hope you will join us! I decided to take the opportunity to use some of my delicious products from Canvas Corp Brands to put together this bright and cheery spring card for my stash. It works for most any occasion I think. 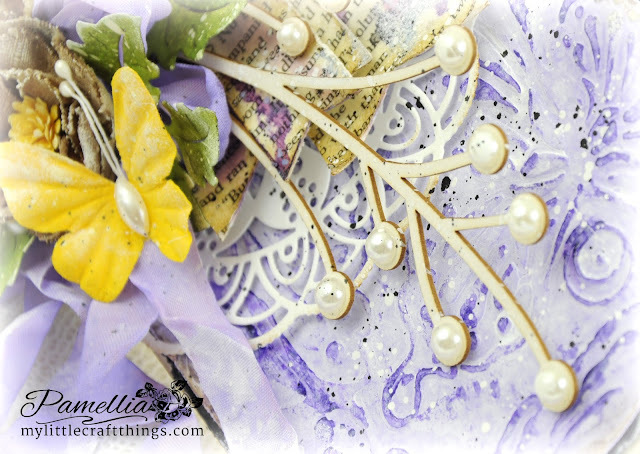 The background was done with a Couture Creations Butterfly embossing folder which I then painted with some Tattered Angels - High Impact Paint Purple mixed with High Impact Paint White. Then I dabbed a little of the striaght Purple on the raised areas and splashed a little diluted High Impact Paint Black and diluted White on the surface. The leaves are Cheery Lynn, coloured with Tattered Angels - Glimmer Mist Kiwi and Glimmer Mist English Ivy. The ribbon was coloured with Glimmer Mist Periwinkle Bouquet. The flowers were hand cut from 12x12 Burlap Sheet - Linen, and the centers were coloured with Baseboard Mist Paint - Daffodil. The doily is also Cheery Lynn. - 613 Avenue Create - Challenge #169 - Anything Goes! No album of mine would be complete without a few shots from before the sun comes up. No amount of ice could stop Mr Scruff from coming to visit. "Oh Mr Scruff, you look so guilty...WHAT DID YOU DO??" "Hello, my name is Pumpkin and I'm new in town." "Is it true that the nice lady who lives here is in possession of some peanuts?" "The rumours are true my dear Pumpkin. Here's what you're looking for, do enjoy!" "Please come again, the buffet is open 7 days a week!" 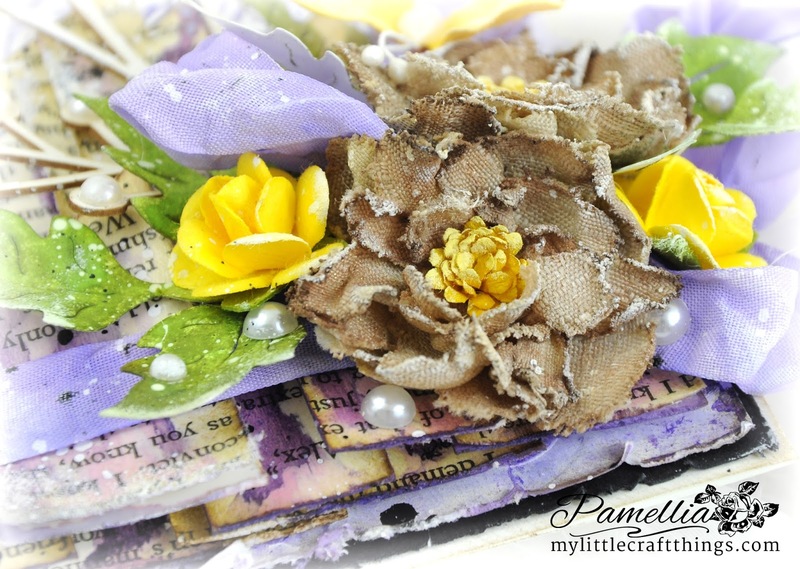 An absolutely stunning colour palette Pamellia, the yellows go so well with the pretty lilacs and those hessian flowers. 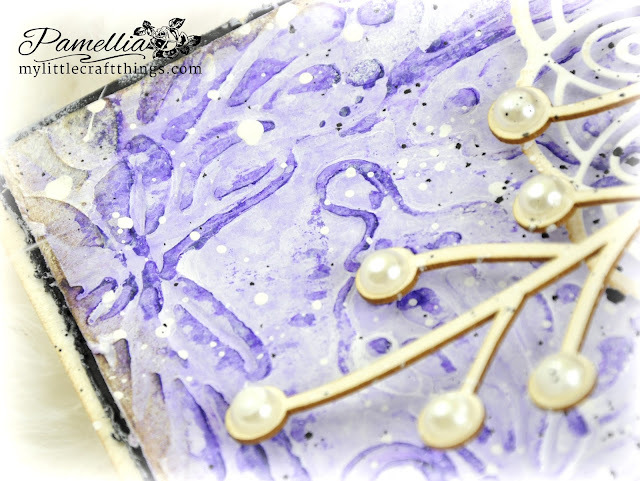 Love the colour combo you have used Pamellia and all those wonderful layers! Hugs! Gorgeous, love the bright colour combo! Can't believe you are so much in the throws of winter still. Lovely to meet Pumpkin! 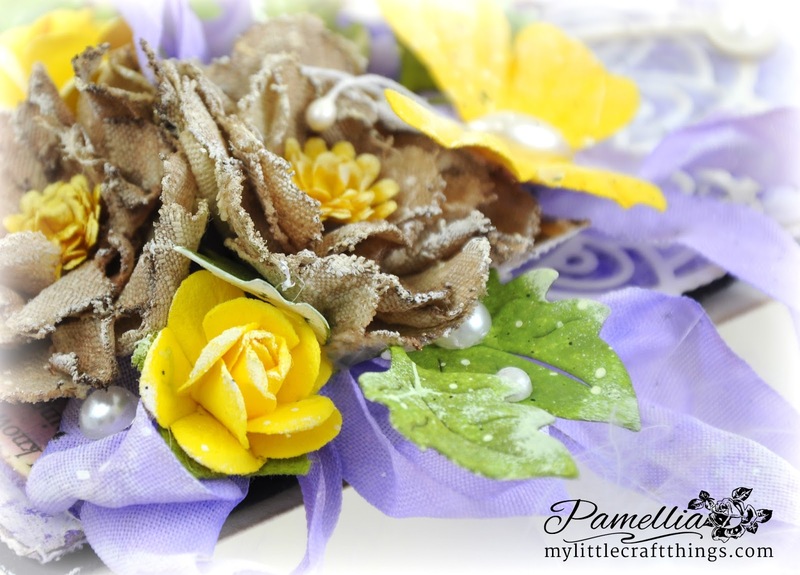 Beautiful colours and textures Pamellia with the gorgeous bold yellow and scrummy layers..fabulous..Little pumpkin is so cute looking up at you. Your lovelies seems to be well, too. This is stunning, the backgrounds are beautiful and I love the colours. 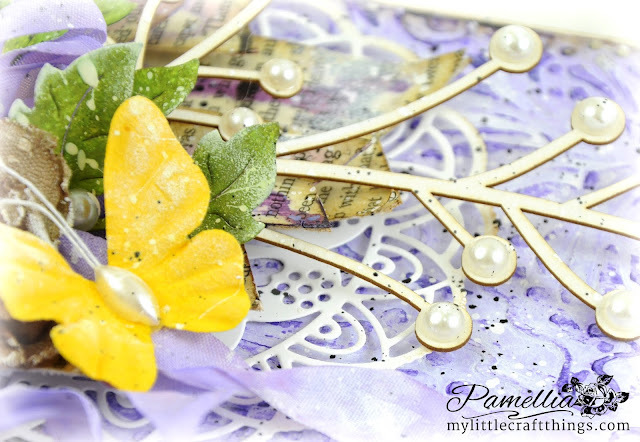 Love, Love, LOVE your fresh springlike colors and the most amazing layers on your beautiful card, Pamellia! You did Crafting By Designs and Canvas Corp proud with this shabby card! (what an honor to be GDT with you!) Those burlap blooms and chipboard spray are the perfect foils to all that soft delicateness. I'm still loving seeing the little icing prank Mother Nature pulled on you in your gorgeous photos! And welcome to the new little Punkin! Pumpkin is a great name for her, and Scruff earns his stripes, too! Cutie pies! Hugs to you! Gorgeous creation, love the bright spring colours and beautiful flowers. Loving the images, so, so pretty, cold but pretty lol! Aw Love Pumpkin, how cute is he, such gorgeous colours, they certainly know where to come for their food supply and I am sure in that weather they are more than grateful lol! What a beautiful card, Pamellia. I never think to use my embossing folders on the background. Love those Cheery Lynn dies you used. Little Pumpkin is tugging at my heart strings--how sweet you are to feed them. 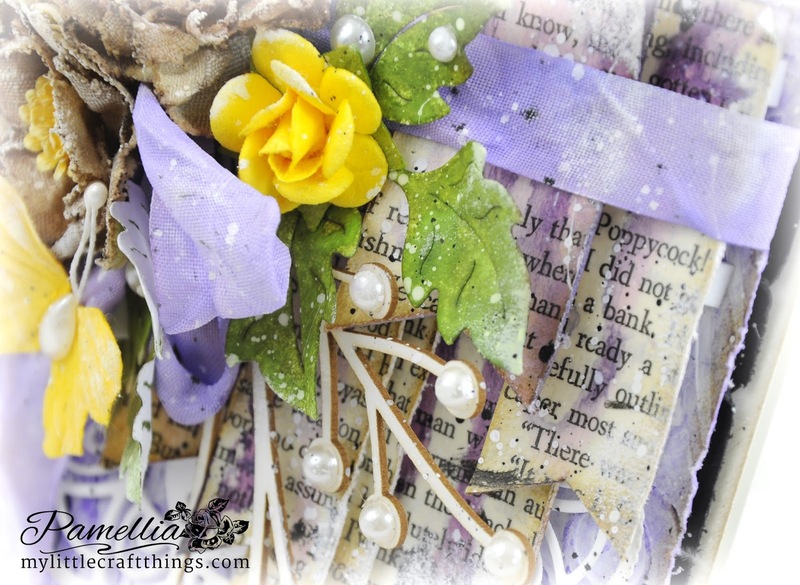 Wonderful card Pamellia, love the beautiful fresh spring colours, fabulous layers and texture as always. Your squirrel family seems to growing, obviously they appreciate your hospitality! The phot of Mr Scruff really made me smile...he does look shifty! Love the fab design, and the wonderful colour choices. As usual you have aced your fab design. Love your photos and especially your furry friends ones. They look soooooooooooooo! darn cute. Love those linen flowers! Great floral arrangement with the tucked in bow! A glorious array of flowers on this card, love the colour palette you have chosen too. Do you have design sketches that you work too or create your own as you go? 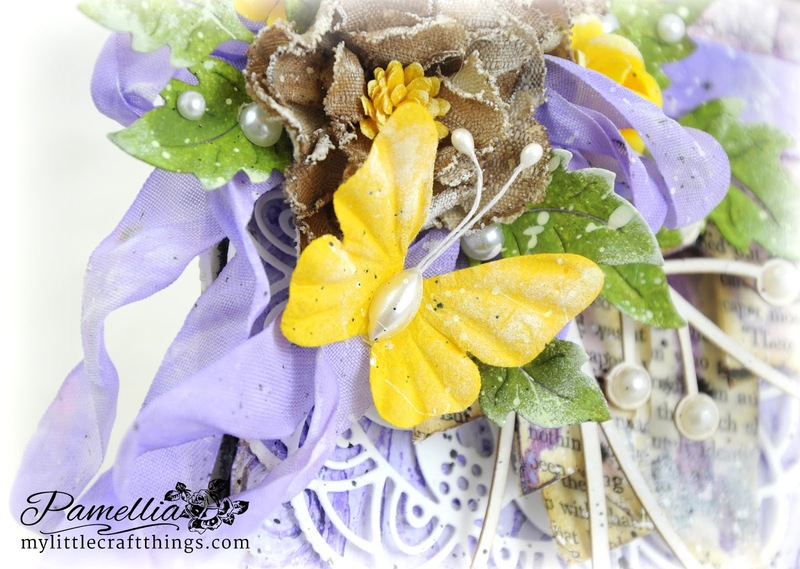 Stunning card Pamellia,the pop of yellow really stands out amongst the purple shades. Wow you'll have the whole squirrel population in Canada soon queuing up for their treats! One more not so usual color combo ! Loved the beautiful cluster at top and textures on the lavender panel ! Oh how beautiful, Pamellia! All the pretty layers and the background are just so luscious! The flowers are simply amazing! Been really crazy busy and hope that you are enjoying spring or when it gets there! Hug! 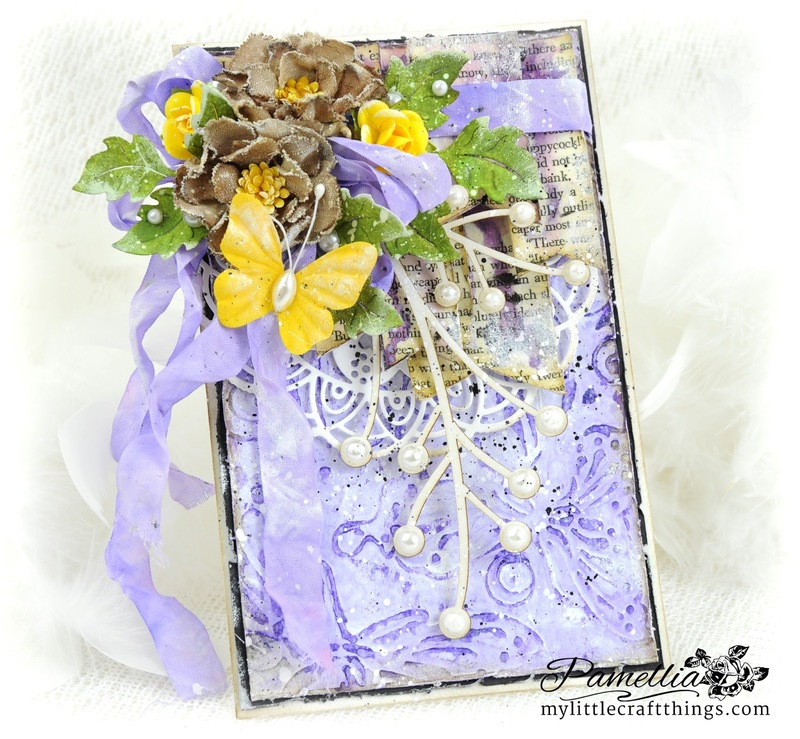 Beautiful card Pamellia, love the colour combo and all those gorgeous layers. Fabulous photos of your visitors. Pamelia, your card is so beautiful ! Thank you so much for join us at the Come and Get It Challenge this week. Loving the rich Spring colours and gorgeous layering, so pretty. just stunning mf...your work truly amazes!! me. I just look at your work with awe....love your talent at adding such amazing details! Incredible talents you have got. OMG, Pamellia, I am always so amazed by your art work! What an exquisite spring card with such vibrant colours and beautiful layering! I adore every single detail here! You are such an inspiration, my friend! I am keep staring at this beauty! It's brilliant! Your photos are as fantastic as your creations! You are super talented in so many ways! Congratulations on your guest DT spot my friend!! Wow, you totally rocked it!! This is stunning!! I love, love the colors!! The pops of yellow are fabulous!! The layering and details are perfect as always!! This is so gorgeous, Pamellia!! I love every single thing about it!! Hi Pamellia amazing colours and detail absolutely love it. I also love your new fur babies they are so sweet, I've never seen a black squirrel before. lovely pictures of scenery too. All those gorgeous elements work so well together on that stunning background. 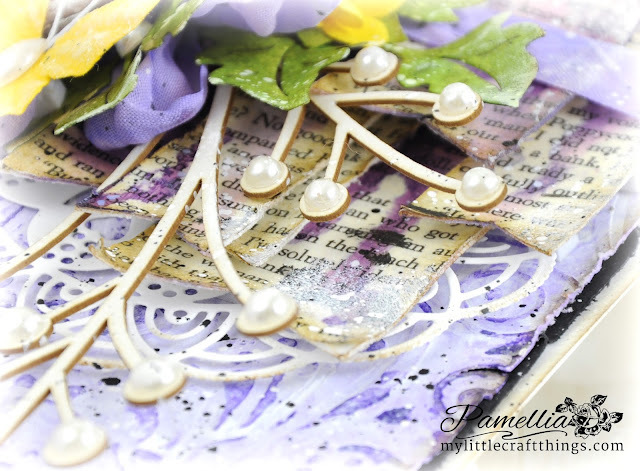 A gorgeous card Pamellia, such lovely spring colours and fabulous details as always. Beautiful stunning creation and gorgeous colours and lots of fabulous embellishments. Absolutely stunning. Love all the layering and embellishments not forgetting the gorgeous butterfly. hugs Mrs A. A gorgeous bright card, it will be super for many occasions. Still with the snow and ice, I hope you get the springtime back soon. The new furry visitors will be happy to come calling to your home, they get looked after so well. What a wonderful creation for your GDT spot, the Spring colours are gorgeous, the layering is beautifully done and the pops of yellow are delightful. There is so much to love about this gorgeous creation! 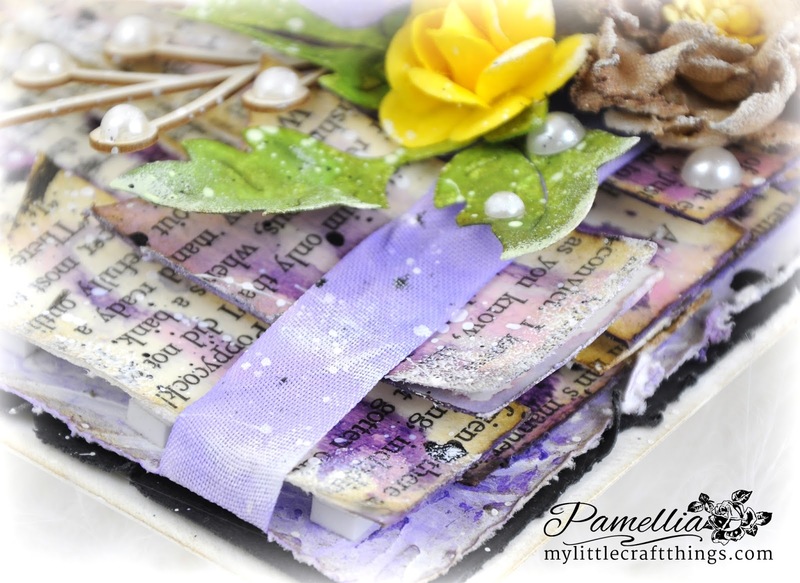 Gorgeous creation Pamellia, love the beautiful colours and your amazing layers, looks stunning. wonderful photos again, love your furry friends. Brilliant choice of colours, so vibrant. Your little friends look cute today. What a wonderful card Pamellia - love those colours together - they are beautiful, and the amazing dimension... you rock these cards every time. Love your wee visitors, and all the cute names you give them!! Omgoodness! You do make me smile with your critter antics! Mr.Pumpkin is just too sweet and I am sure that is exactly what he was thinking! Fabulous card. I loooove purple and have often teamed it with yellow but I have never tried coffee, doesn't it work well? All three are a great colour combination and the little butterfly is so pretty. It seems your squirrels are on the move now that spring is in the air. I never cease to marvel at the variation in their colours, it seems no two are the same. Pumpkin looks like they may become a regular visitor. Oh my word, wow...another beauty!!! I LOVE the colors on this as well! The layering is so beautiful and I adore all the lovely textures and fine details!! So pretty Pamellia!! So lovely! Those flowers are just gorgeous! Wow! Love the purple and yellow color combo, Pamellia! Striking and utterly gorgeous! Do you suppose the word is out among the squirrels? Head to Pamellia's...she's got great grub ;) Hugs! So pretty Pamellia! Congrats on your gd gig! love the pearls and flowers! Oh my those colours are stunning!! What a gorgeous creation! And I love seeing those cute squirrels ... your new Pumpkin is so sweet ... brilliant photo! So beautiful card! I adore all your works! Incredible! I love the beautiful colours and your burlap flowers, they look like they are cut the same way as the others, you have so much patience. Another STUNNING creation. Love your icy Wintry photos and of your lovely selection of character squirrels. Hope your Spring warmth comes soon, we have had a few wonderful days of promise with warm sun and blue skies. Well Poppycock!!! Everyone of your book pages are just poppycock and it says so right on top!!!! Heheheheheh!!! Sorry just couldn't resist teasing you Pamellia!!! I like how you made a little row of book paper banners but when I saw POPPYCOCK - I just cracked up!!! Donno why put I have always loved that word!!! This is a bright and cheery card with a touch of elegance! Such a fun and amazingly stunning contrast between the pearls, doily and the burlap flowers! Another really lovey creation for sure. And what... you have another baby.... how precious is your Pumpkin.... VERY! You KNOW I adore her (or him) colors (orange) - just look at the tip of those ears... wow. And that picture you took of her just looking straight up at you is PRICELESS. I'm thinking you may have to write a squirrel book dear girl! And Mr. Scruff DOES look guilty in that picture - hehehehehe - sooo precious!!! And you totally cracked me up with your knot in knickers comment - eheheheheheheheheh!!! Love the icy photos too. GREAT post - once again :) XXj. Absolutely gorgeous Pamelliia! I love the bright colors and your stunning linen flowers!! Fab pictures too! Beautiful once again Pamellia. Georgous combination of colours. Love the brightness of the butterfly.and everything else is just perfect. So stunning!!! Love the colours and your background technique. A stunning card Pamellia. Beautiful colours and the linen flowers are amazing. 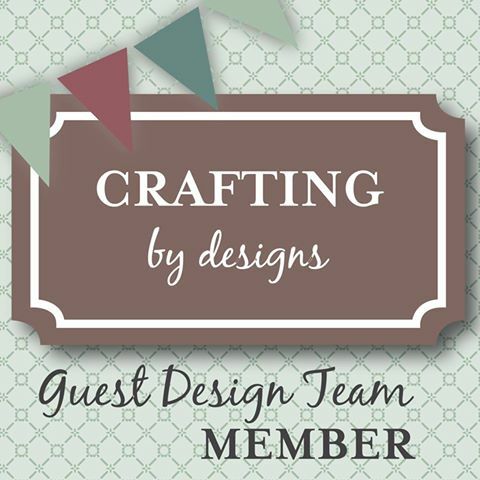 The die cuts add lots of layers and dimension and the script paper is a great addition. Sally.x. A really beautiful card huni, love the colours, the layers, well everything! You know I adore everything you create. The brighter coloured creations are the ones that really grab my heart as I love the bright colours. 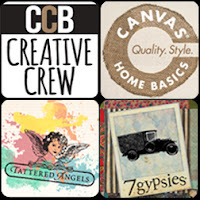 I am hoping that at some point the Canvas Corp products will be easy to get hold of over here as I love their papers, embellishments and well everything too!